This genus is accepted, and its native range is Philippines, E. Australia, New Caledonia. Perennial. 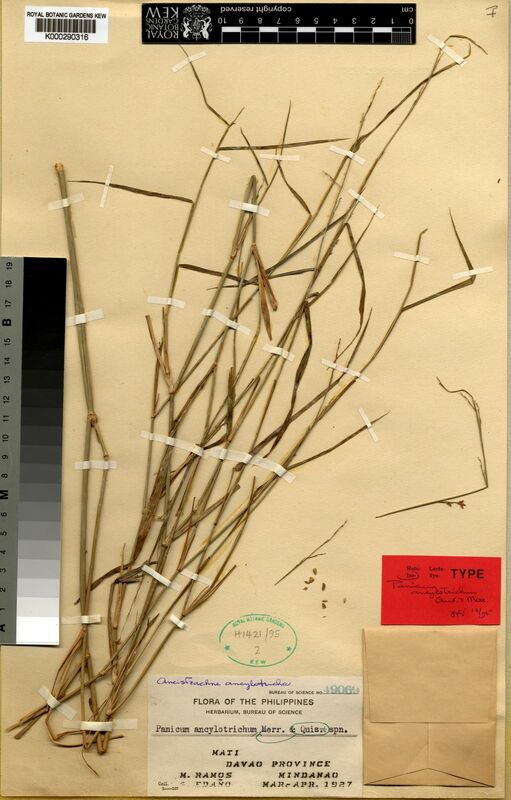 Culms decumbent (1/3), or rambling (2/3); 30-110-200 cm long; wiry. 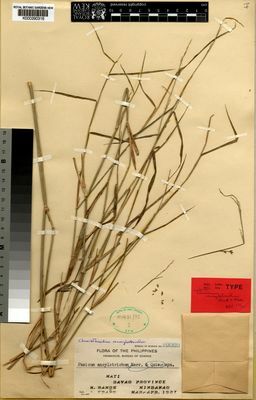 Lateral branches sparse (1/2), or ample (1/2). Ligule a fringe of hairs. Leaf-blades persistent (2), or deciduous at the ligule (2); linear, or lanceolate (1). Leaf-blade margins cartilaginous (1/1). Inflorescence a panicle (3), or composed of racemes (1). Panicle open (3/3). Racemes single (1/1); paucilateral (1/1). Spikelet packing abaxial (1/1). Spikelets solitary (3), or in pairs (2). Fertile spikelets sessile and pedicelled (1), or pedicelled (3); 1-2 in the cluster (1/1). Pedicels tip cupuliform (1/1). Spikelets comprising 1 basal sterile florets (3/3); 1 fertile florets (3/3); without rhachilla extension. Spikelets elliptic (3), or oblong (1); dorsally compressed; 2.49-3.562-5 mm long; falling entire. Spikelet callus attached transversely. Glumes one the lower absent or obscure (1), or two; reaching apex of florets; thinner than fertile lemma. Lower glume oblong (1), or ovate (3); clasping (1/1); hyaline (1), or membranous (1), or chartaceous (2); without keels; 0 -veined (2), or 1-2 -veined (1), or 3 -veined (3), or 4-5 -veined (1). Lower glume lateral veins absent (1), or distinct (3). Lower glume surface glabrous (2), or puberulous (1), or pubescent (1), or pilose (1). Lower glume apex obtuse (1), or acute (3). Upper glume lanceolate (1), or oblong (1), or ovate (2); chartaceous (2/3), or scarious (1/3); with undifferentiated margins (2), or hyaline margins (2); without keels; 5 -veined (1), or 7-8 -veined (1), or 9 -veined (3), or 10-11 -veined (1). Upper glume lateral veins without ribs (2), or ribbed (2). Upper glume surface pilose (3), or hispidulous (1); with tubercle-based hairs (2), or hooked hairs (3). Upper glume apex obtuse (3), or acute (1). Basal sterile florets barren; with palea (3), or without significant palea (1). Lemma of lower sterile floret lanceolate (1), or oblong (1), or ovate (2); membranous (1), or chartaceous (1), or coriaceous (2); 7 -veined, or 8-9 -veined (3); without ribs (2), or ribbed (2); obtuse (2), or acute (2). Fertile lemma elliptic (2), or oblong (1), or orbicular (1); cartilaginous (1), or coriaceous (3); of similar consistency on margins (2), or much thinner on margins (2); without keel; 5-7 -veined (1/1). Lemma surface smooth (3), or punctate (1). Lemma apex acute; without ornament (1), or laterally pinched (2), or pubescent (1); muticous (3), or mucronate (1). Palea membranous (1), or coriaceous (3). Tropical Asia (1), or Australasia (2), or Pacific (2).